Along with Mr Anthony Wedgwood Benn, Eric Heffer is the most prominent leader of the ‘left’ in the Labour Party. The following outline political history of the Merseyside member of this duo is meant as a contribution to a political understanding of the nature of this leadership. The recorder of this history declares that, despite the amazing lack of principle therein, any resemblance to actual persons in the labour movement and their actions is absolutely authentic. At the Party Congress, in moving the resolution on behalf of Welwyn and Hertford, I made the point that the policy of Pollitt, Campbell and Co., was a betrayal of Marxism and an acceptance of left social democratic theories, revisionism of the Kautskyist brand. I attacked their policy on production (they supported an all-out drive to increase production); on strikes (they opposed strikes); on conscription (which they still support); on nationalisation (which we supported, but opposed the leaders who made it appear that socialism was thereby being introduced). Above all we opposed the theory of diminishing contradictions put forward in Pollitt’s How to Win the Peace and Answers to Questions. This opposition was composed of both intellectuals and workers. I am a joiner; other comrades were, for example, electricians and engineers, while some (a minority) were graduates from Oxford. Immediately following the Congress, Heffer and a number of others were expelled from the Communist Party. Welwyn Garden City branch was disbanded and the neighbouring branch at Hertford was ‘reorganised’. Eric Heffer appeared in Liverpool in the early 1950s. His subsequent course was determined by his refusal to subordinate himself to the revolutionary discipline necessary to lead the working class. In this period he called himself an ‘independent Marxist’ — i.e. independent of the revolutionary party and revolutionary discipline. He sought for theoretical justification in Rosa Luxemburg. The question which unties the overwhelming majority in the Labour Party [he wrote) including Attlee, Bevan and the Trotskyists is that socialism will come through parliamentary action. The Labour Party is above all else a parliamentary party and the divisions and wards are nothing but cogs in the electoral machine. when Stalinism was in deep crisis and the Trotskyist movement was winning the Liverpool leadership of what was then a strong Young Communist League, Heffer was heard to declare: ‘When I’m accused of it now, I don’t deny I’m a Trotskyist.’ The Trotskyists, however, denied it quite emphatically and definitely. During the latter half of the 1950s, Heffer, while attacking Trotskyism for its ‘opportunist parliamentarism’ and entrism’, remained a delegate from his union branch to the Liverpool Trades Council and Labour Party. At this time, the TUC had not split up this organisation into two bodies — a Liverpool Trades Council and Liverpool Labour Party. At the same time as denouncing the Labour Party in sectarian articles, Heffer was keeping the door open. He was under the strong pull of social democracy. Eventually, at the end of the 1950s he became a Labour councillor. Marxists have truly declared that a sectarian is but someone frightened by his own opportunism. In 1960 Heffer proved his worth to the Establishment and to the reformist bureaucracy. In the seamen’s strike of that year, together with Simon Mahon, the right wing Catholic MP for Bootle, he worked to end this unofficial struggle. The strike lasted for seven weeks over August and September. It was led by the National Seamen’s Reform Movement, a body with support in all British ports. It had been set up to campaign for democratic reform within the notoriously bureaucratic National Union of Seamen. The NSRM called a national strike when, without consulting the rank and file of the union, the Executive Committee of the NUS made an agreement with the Shipping Federation. They accepted conditions and wages far below what the majority of seamen had been expecting. The strikers demanded a 44-hour week, a £4 a month increase, and the election of shop stewards to represent them aboard ship. Immediately after the strike began, sixteen seamen were arrested in London. Eight of them were sentenced to one month’s imprisonment. Eight others were sentenced to forfeit six days pay. The charge was that by striking they had ‘disobeyed a lawful order’ under the Merchant Shipping Act of 1894. During the course of the strike there were arrests in every port, with fines and gaolings. On August 13th, warrants were sworn out for the arrest of the Liverpool leaders of the NSRM for ‘intimidation’. In Montreal, 37 British seamen were arrested, again on the charge of ‘disobeying a lawful order’. Among the Liverpool working class, support for the seamen was overwhelming. There were several big demonstrations through the city. On August 16th, Merseyside dockers struck for a day in sympathy with the seamen and five to six thousand dockers and seamen marched to the Pier Head in a silent demonstration carrying a banner inscribed: ‘Death to the 1894 Act’. As a result of action by the Cunard Shipping Company, the chairman of the National Seaman’s Reform Movement — Paddy Neary, a Liverpool seaman — was brought before a court in London for disobeying the order of a judge restraining him from conspiring to incite or inciting Cunard seamen to break their contract of employment. On August 23 he was found guilty of contempt of court and taken to Brixton prison. The gaoling of Neary shocked Merseyside. On August 24 two thousand seamen marched through Liverpool. The Trades Council and Labour Party called for a demonstration on Tuesday August 30. On that day there was the biggest demonstration that had ever been seen in Liverpool. At the end of the march the Liverpool Stadium was packed and overflowing. It must be said for Simon Mahon MP, the only right winger on the platform, that he gave no indication that he was lighting any fires over Paddy Neary. Mahon offered to ‘mediate’ between the seamen and their union. His aim was to bring back the strikers, he said ‘into the fold of the negotiating machinery of the NTJS, the only body with whom the shipowners will talk’. Thus the idea of ‘mediation’ was born. Following this meeting the mediators appeared in the centre of the stage. They were: Simon Mahon, Eric Heffer and Simon Frazer, full time secretary of the Trades Council and Labour Party and a direct link with the bureaucracy at Labour and TUC headquarters. Hart joined the team in the later stages. The mediating committee had not come into the fight for the purpose of widening the campaign and developing the fire in the labour movement. The meeting in the Stadium in fact was the peak point of any action to free Neary. Neary remained in gaol until after the strike ended in confusion, thanks to the mediators. The stadium orator — Hart — joined the others to extinguish the flames. The task of Heffer and the other three ‘honest brokers’ was to move everything away from the major issues of the strike, including the release of Neary, to a question of meetings between strikers and union leaders. Heffer, Frazer and Mahon sailed off to the Isle of Man to get hold of Sir Tom Yates, general secretary of the NUS, who was attending the Trades Union Congress, and discuss with him how to end the strike. Yates refused to address the strikers but eventually agreed to send Scott, the assistant General Secretary, to Liverpool. Scott spoke to a seamen’s meeting in Liverpool’s Philharmonic Hall on September 9th, with Heffer in the chair. It was long and stormy. At one point Mahon told the seamen not to be childish. Heffer said that If they were to stay out till they got the points they were demanding then they would be out for ever. At one point the meeting almost broke up. It was saved by Heffer. It happened over the question of union branch meetings. All over the country seamen had been demanding branch meetings which had been refused by officials. Scott was asked to call branch meetings. He said he couldn’t do it. At that answer seats clicked back with a sound like machine-gun fire. The entire audience rose to leave the hall. Heffer sprang up, holding up his arms like Moses before the River Jordan. ‘Brothers! Brothers!’ he shouted, ‘I have sat through this meeting hoping for a glimmer of light. Someone has to talk about this thing in a sensible manner. Let’s continue.’ After ten minutes of hard work he persuaded the audience to stay. A shaken Scott pledged that he would try to persuade the officials of the union to countermand the order that no branch meetings of the union would be held before a return to work. Two days later Yates declared there could be no question of meetings before the strike was over. The mediators went into action again. This time they succeeded in ending the strike. Yates agreed to meet them with two members of the NSRM – Barlow and Kean. Following that meeting and further contact between the mediators and Scott, the Liverpool NSRM committee recommended a return, and Liverpool seamen on September 22 decided to end their strike. Other ports followed. The strike ended on the terms worked out with the help of the mediators. After a public declaration that the strike was ended, branch meetings would immediately take place. The union leaders pledged to fight victimisation and seek a revision of the 1894 Merchant Shipping Act. There was no mention of 44 hours, the £4, or the release of Paddy Neary. That the seamen’s strength was not completely shattered by this debacle, and that in the following period there were some changes in the union and the election of shop stewards on the ships, is despite the activities of Heffer and the mediation committee in the strike. So far as Heffer was concerned it marked his emergence as a ‘responsible’ figure. Both publicly and behind the scenes! did my best to support the seamen and to ensure that a quick and satisfactory settlement was reached. I invited Joe Kenny and other seamen executive members to the House of Commons for discussion to find out what they would really [my emphasis, BH] settle for, and with their agreement passed this information on to Harold Wilson. What type of support he was giving the seamen we can leave him to describe on the next page. When the Government invoked the Emergency Powers Act, Michael Foot, Ian Mikardo and I, all spoke against it in the House. My speech was an emotional one, which, on reflection, I do not regret. I do regret, however, that we did not vote against the introduction of the Emergency Powers Act, whilst our opposition was sincere, our failure to vote was not entirely understood in the country. Many trade unionists wondered why we had not voted. I too, wonder at this and have no explanation for it. That’s what he says, word for word! But further! Not only would he have his readers believe that he does not know why he acted the way he did but he told them he was also bewildered by the activities of the Labour Government. He plaintively relates: ‘The shipping employers had never been friends of the Labour Party and I could not understand why the Labour Government had come out so firmly against the seamen.’ These two pages of his book — 58 and 59 — should be framed and hung at the Pier Head so that every worker who demonstrates down there can read them. How snivelling it all sounds, when we remember that demands had been made again and again on Heffer to fight Wilson. Immediately after the election of a Labour Government in 1964, the Socialist Labour League (predecessor of the Workers Revolutionary Party) and the Young Socialists exposed how the Government was seeking solutions to the economic crisis demanded by the international bankers. In her book Inside Number Ten even Marcia Williams recalls how the ‘Gnomes of Zurich’ throughout the early period had continued to press upon Harold the need for ‘freeze and squeeze measures’. We should add that she also relates how at No. 10 the question was posed — not very seriously of course — about holding an election to decide, as she puts it, ‘Whether we were going to be a country unable to practise democracy because we were dictated to by overseas financiers’. The final word on this however, was that of Lord Cromer —the Governor of the Bank of England — a frequent and backdoor visitor to No.10 during this early period of the 1964 Government. He knew Wilson and his clique of reformist leaders would never willingly put capitalism at risk and he settled the discussion by telling him that such an election would itself have disastrous financial results. The weakest in society were bit first by the new Labour Government. An increase to the old age pensioners was refused. On February 4, 1965, the Young Socialists organised a march of one thousand with a strong contingent of old age pensioners and lobbied the left MPs including Heffer. On February 26, 1966, there was the great demonstration and lobby against the anti-union laws called by the Lambeth Trades Council. As a result of the campaign by the SLL and the Young Socialists, all the big construction sites on Merseyside stopped work on the day of the lobby and six hundred Merseyside workers travelled to London. Again Heffer was lobbied by trade unionists and Young Socialists. During the seamen’s strike itself, on May 25, nearly eight thousand Merseyside dockers stopped work in support of a London demonstration and lobby of Parliament called by the Young Socialists. They were expressing a deep-going concern amongst the working class at the capitalist policies of the Labour Government and its attacks on workers’ rights. Dockers, seamen and Young Socialists once again demanded a fight. There is legislation being prepared to undermine rights which unions have won over a number of years. In a lobby of Parliament on June 22nd, shop stewards from this site met Mr. Heffer, in company with a number of other Labour MPs who said they opposed the wage freeze. The outcome of the meeting was that we were told to fight the freeze outside Parliament and leave it to them inside. Fair enough we thought. But I’m afraid it hasn’t quite worked out like that. Speaking as the secretary of the Lucas-CAV joint shop stewards’ committee I know members of this committee have put a lot of time and effort into the fight. What fighting has Eric Heffer done? A couple of weeks ago Heffer was given the opportunity of introducing a private members Bill. What subject did he choose? He sought legislation to outlaw coursing, a so-called sport where hounds tear a hare to pieces. While I may agree with Mr Heffer’s sentiments on this matter it is surely of secondary importance to the fact that the rights of trade unionists to bargain for wages are being torn to pieces by the profit-hungry hounds of Big Business? I would ask in conclusion that every trade unionist on this site supports the lobby of Parliament on February 2lst when we intend to tell Eric Heffer to get his priorities right and also to let him know in no uncertain manner: You can’t run with the hare and hunt with the hounds. The Fazakerly Lucas-CAV workers and BMC workers had called a demonstration and lobby for February 21. It was supported by the Young Socialists and 1,500 marched and demanded that the Left MPs fight. Heffer and others refused even to organist a fight against Wilson in the Parliamentary Labour Party. The Communist Party of Great Britain follows in the wake of these bureaucrats, and at the same time provides a convenient cover for these lefts in Parliament, who, while voicing their opposition to Wilson’s policies are only prepared to go that far. It is the Young Socialist movement, Keep Left, and the thousands of youth who support our programme and who are constantly waging a campaign against the Labour Government’s policies. Heffer had no intention of listening to revolutionary Marxists fighting for socialism. The spinelessness of the Tribune MPs encouraged the Labour Government to press on with their anti-legislation. Only widespread and powerful movements among the working class in their unions swept Heffer even to vote against Wilson’s plans in Parliament in 1969. Here is a good point to recall that his colleague now in the leadership of the Tribune group, Mr. Anthony Wedgwood Benn, continued to assist Wilson through all this period. What does it matter if you betray, so long as you admit it was a mistake? At the very beginning of 1969 the Labour Government introduced its White Paper ‘In Place of Strife’. Heffer called the Government’s proposals a ‘barrel of honey spoiled by a spoonful of tar’. Those proposals included forcing trade unionists to have a ballot before a national strike was called; compulsory ‘cooling off periods before strikes; the deduction of fines from wages and the compulsory registration of trade unions. Heffer reports that ‘resolutions against In Place of Strife poured into Transport House. MPs sympathetic to the White Paper went home to their constituencies and found little sympathy’. So great was the opposition among trade unionists that in March, 56 Labour MPs dared to put up their hands against the White Paper in the House of Commons. With anger amongst the ranks of the working class there was a mass one-day strike on Merseyside. Over ten thousand workers marched in London. In face of widespread demand for General Council was forced to call an emergency TUC. The Tribune group was forced to warn the Government it was heading for a serious clash with the Labour movement throughout the country. On a motion of Gormley, the NEC of the Labour Party repudiated ‘In Place of Strife’. Callaghan voted for the motion. However, Heffer and the Tribune — who advocated a ‘genuinely voluntary incomes policy’ — heaved a sigh of relief soon after the emergency TUC. Both the Labour and the trade union was shaken by the mass opposition to the proposals to shackle the unions. An agreement was reached between the TUC and the Government. The Government retreated on its proposals. A ‘solemn and binding undertaking’ was given by the TUC General Council that it would seek to prevent unconstitutional stoppages and ensure that affiliated organisations would not take strike action until procedure was exhausted. In reference to the penal clauses which the Government had been proposing a Tribune editorial now declared: ‘They’ve gone for good.’ [my emphasis — BR] Heffer and the other lefts rejoiced. Here, thank God, was once again, unity in the labour movement. When the Tories won the election in 1970, Heffer was brought onto the Labour Front Bench as a spokesman against the Industrial Relations Bill. Ignoring Tribune’s editorial, the Tories built on the Labour Government’s attacks on the unions and extended the penal restrictions. When the AUEW called a one-day stoppage to coincide with the Special Trades Union Congress of March 1971, the Tories challenged Heffer in the House of Commons to state his attitude to it. He refused to come out in support. Wilson had condemned the strike! Later, of course, he had no alternative but to support the one-day General Strike that the TUC was forced to call against the imprisonment of the Pentonville dockers for picketing. There is no credit due to Heffer and the lefts for the collapse of the Tory Government under the mass opposition in the working class expressed by the miners. The Labour Government which followed repealed the Industrial Relations Act. However, with the assistance of the TUC General Council, afraid of the development of mass struggles, it continued the attacks on the working class with the Social Contract. The Government set itself out to smash workers’ struggles to defend their wages and standards. Heffer praised the Government for its ‘dismantling’ of the Industrial Relations Act. Meanwhile, of course, the instruments for civil repression were steadily strengthened in the police and the army. Oppression and torture in northern Ireland continued. With hardly a squeak Heffer watched while the Government allied with Liberals, Powell and Ulster Unionists. The Government had put in hand preparations for Emergency legislation. Had it come before Parliament, would Heffer have voted against this time? There is not the least indication in his activity during this last Labour Government that he would have done so. He might, of course, have apologised later, as the mass movement developed! Heffer stayed out of the seamen’s strike this time. His criticisms of the Labour government were that of a sober Parliamentarian. Words against the right wing were one thing, but mobilising workers against the TUC leaders and the Labour Government in what could only turn into a struggle for power, was something entirely different, So, in the Grunwick strike and the firemen’s strike, Heffer gave some verbal support but made no attempt to fight the betrayals of the Labour and trade union bureaucrats. The anti-working class nature of the Labour Government, its danger to the working class, was absolutely clear. But Heffer was fundamentally opposed to the WRP demand to force the Government out and unleash the mass movement. For him it has been a question of opposing without fundamentally breaking with the right wing. His excuse is that the utmost unity of the Labour Party has to be preserved, in order to have it as an instrument to introduce socialism through Parliament. 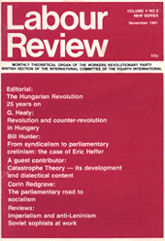 ‘One can still try the Parliamentary road and have revolutionary objectives,’ he wrote in 1973. In his book he held up Chile as a example. He declared his socialism ‘was very dose to the socialism of President Allende’. Very soon after Heffer wrote this, Allende himself lay in the Presidential palace murdered by the troops of Pinochet. Thousands of Chilean trade unionists, socialists, Stalinists and communists were tortured and butchered because the Parliamentary road meant that the reactionary sections had been allowed to prepare within the capitalist state, and particularly in the armed forces, while Allende and his fellow socialist and Stalinist leaders refused to mobilise the working class. socialism via the PLP is an easy one.’ Let us have patience, he says. ‘Patience is not an easy virtue but it is certainly required in our British political set-up’. Patience? Over 25 years the Parliamentary Labour Party has not even tackled any of the great problems which faced the working class when Heffer became a member in 1964. It is the strength of the working class itself, expressed many times against the wishes of its leaders, which has prevented the complete smashing of that class. It was not the PLP, which, for example, flung out the Tories in 1974. On the contrary, the PLP bore its responsibility for the grave dangers in the situation which existed then, with the military preparing a coup — as Jack Jones revealed later. The mass movement of the working class did not inspire him. The break with the right wing frightened him. Together with the revisionists and Stalinists today the role of Heffer is to divert workers as they go through the experience of a decisive break with social democracy. The future of Heffer as of all those who perform this role depends on us. It depends on how we train a cadre, conduct a theoretical and practical struggle against centrism and revisionism, and build a revolutionary leadership of the working class.